The microcomputer controlled ball-rebound-tester is designed for the determination of the rebound elasticity of foam materials acc. to ASTM D 3574 and DIN EN ISO 8307. 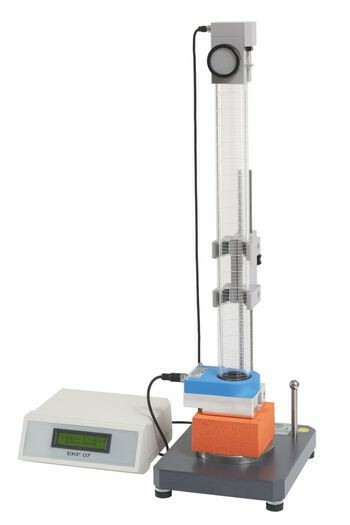 A quick, easy and reliable measurement can be done with the ball-rebound-tester because of its innovative technique. This top quality unit is ideal for the quality control of foam materials during the production and in the acceptance department. A two lined display reads the measured value and median value in %. The testing device is equipped with a serial interface. Test stand with down pipe 500 mm. 2 line spacing LC-display shows measuring result and median value in %.